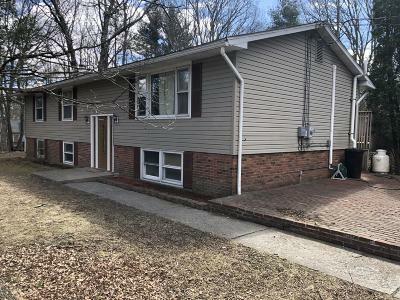 VERBAL ACCEPTANCE-NO MORE SHOWINGS***Newly Renovated***SPACIOUS Bi-Level with 5 Bedrooms, 2.5 Baths on 1 ACRE Corner property * Features Large Family Room with Fireplace & custom bar,Screened Porch, Patio, Big Deck, 2 Car Garage PLUS 1 Car Garage * GREAT LOCATION!! Close to DWG, Commuter Bus, Medical Facilities, Shopping, Dining, Skiing, Golf, Medical facilities, Casino & Water Parks * NO DUES & LOW TAXES! !